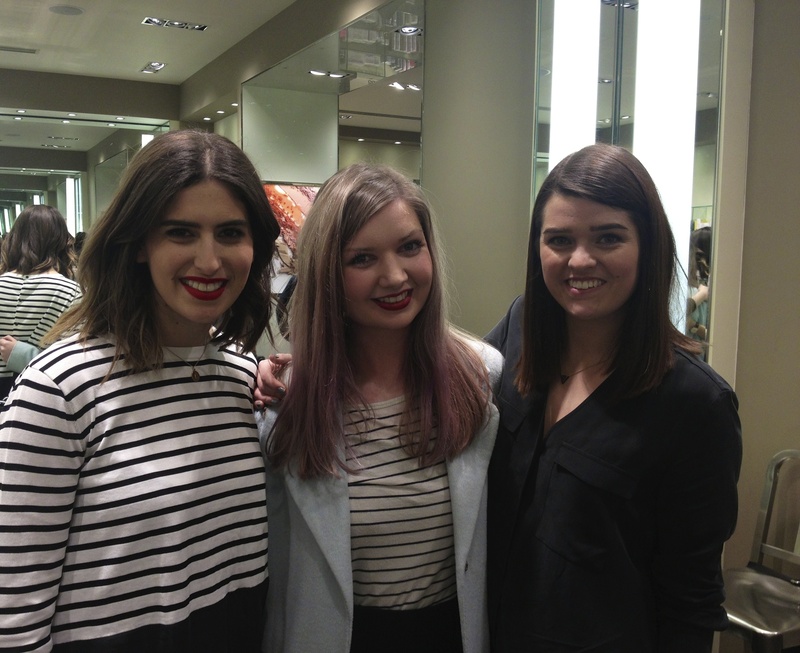 With the same feeling of nervous energy similar to that space of time when you’re waiting to meet an idealised band member after a gig, I hovered outside Space NK to meet my favourite Youtubers, Vivianna Does Makeup and Lily Pebbles. After that dramatic introduction, I’ll sum up my Beauty Chat Live journey. From watching the pair provide useful and often hi-larious responses to beauty questions posed by Twitter users, the chance to see one of these chats in person was too good to miss. With 15 spaces to a session, competition would be fierce for the opportunity to combine shopping and talking with these two well-respected bloggers. -Following the YouTube announcement that Anna and Lily would be touring the UK to chat all things beauty, I made a mental note to phone up for a space at a London store following the YouTube announcement. -I forgot to do so the next day once the tickets went live. -Cue frantic phone calls trying to get through to Space NK to book a place. -After getting through, cue some minor panic attacks with the gnawing thought that I had not in fact managed to secure a spot at a session, and had just given my card details to a random lady in London. -Unwilling to phone up again and quiz the poor person who answered the phone as to their true identity, all that was left was to get my imminent move down to London over with and turn up at the Space NK store on the 18th February. -After getting off the tube and walking in the opposite direction for a good ten minutes, my boyfriend, who has been subjected to hours of YouTube beauty videos in the background whilst he watches TV, helped navigate me back to the store via yet another frantic phone call. -Whilst waiting outside Space NK, I approached a group of girls and declared ‘Did anyone come here by themselves?’ in a desperate bid to make friends. -I made a friend, a nice one named Jacqueline who was from New York and a firm favourite with everyone that evening after sporting a bright orange lipstain from Kat Von D’s collection. -After the earlier session had ended, the Space NK staff let the 7:30pm group into the shop for a welcoming flute of something fizzy. Despite having been in Space NK many a time, it felt like I was Charlie walking into the Chocolate Factory. That is, if Charlie was a girl who had their eye on a new setting powder and cleanser instead of a chocolate bar. -Walking in, Jacqueline and I got giddy. We could see Anna and Lily in the distance, and spotted their boyfriends Rich and Mark in the corner. We felt a bit strange about saying Hi to the boys as we passed- even though they feature in the girls’ everyday blogs, it was a wee bit like making the move to approach members of the band when you know their name but they don’t know yours. Whilst we couldn’t pluck up the courage to greet the guys that night, I’ll make up for that now. Hi. -Before Anna and Lily took their places for the Q & A, we had a look around the brightly coloured counters. With the £15 booking fee (redeemable that session) burning a hole in our pockets, alongside the deal that granted a goodie bag with a £50 purchase on the night, I felt like Space NK was my oyster. As my bank balance can now tell you that can be a very dangerous feeling. -The Q & A was short and sweet, with most of us staring back silently at Lily and Anna with expressions of awe as they waited for us to speak. Blogger Lucie kicked off the questions, which spurred me into putting my hand up to ask something spontaneous that went along the lines of: ‘How do you suggest starting to wear a bold lip at work, if your colleagues are going to be all ‘Ooh you’re wearing makeup today’. It sounded just as eloquently said as it looks written down there… The answer- start by wearing a tinted lip balm, then gradually start introducing more colour so your fellow desk mates don’t get too much of a shock. Saying that, I might attempt a bright colour tomorrow. Or I’ll think about it. I’m wild like that. -My new New-York-Friend-Jacqueline ended up asking the last question, and we beamed at each other after the chat ended. With silent nods, we acknowledged our excitement at speaking up, although I felt like I could’ve asked questions for hours. Now to pick up a shopping basket. -Throughout our browsing, we were met with on-hand Space NK staff prepped and ready to answer our many questions. 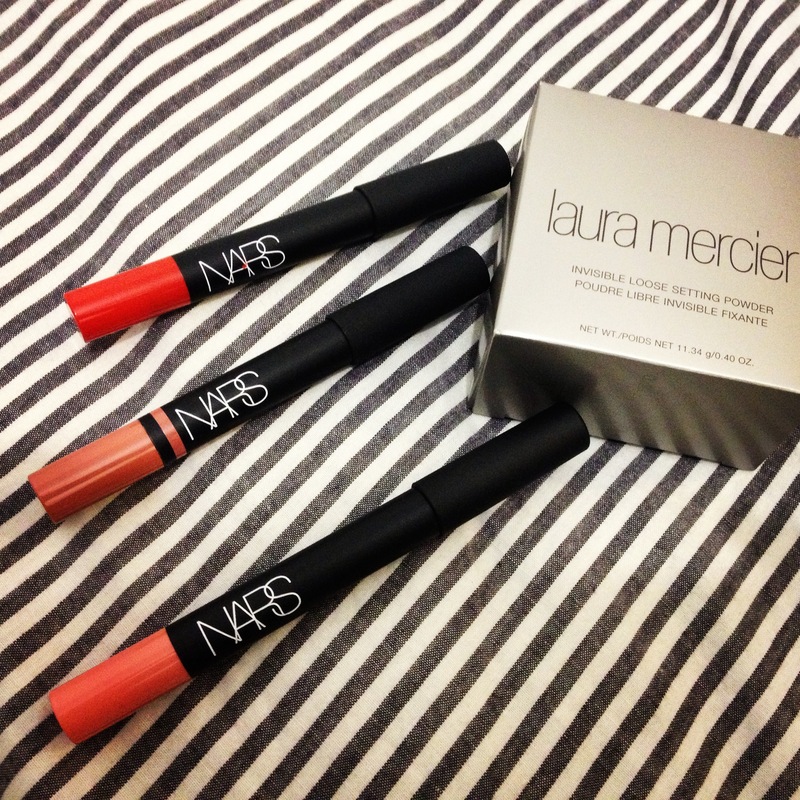 Following a one-to-one mini makeover from the knowledgeable Becky from Space NK HQ, I picked up the specific Laura Mercier setting powder that I was looking for, alongside 3 Nars Lip Pencils that I was coveting after reading up on blog posts and watching multiple videos. From top to bottom: Red Square, Biscarne Park and Bolero. 3 pencils? Pricey, but they are great quality, and it was my birthday the next day. As I still to try justify myself to this day. I also can’t go on watching another of Anna’s videos without trying out her much-loved Red Square pencil. -With our shopping bags containing the elusive goodie bag, a wee birthday sample and our purchases in tow, we waited patiently for our turn to talk to the duo. What followedwas a series of very excited exchanges on my behalf, featuring slightly out of breath inputs of ‘I’ve just moved down from Scotland’, ‘I’ve spent so much’ and ‘I’ve just met Jacqueline tonight!’ making an appearance in the conversation. Smooth. Despite being an incredibly long night for Anna and Lily (whilst wearing high boots for no matter), the girls were engaging and really lovely to talk to as they asked us questions and laughed away. We even got to do a mini-haul as we talked through what we bought from the night, which was quite surreal. With plenty of opportunities for photos, the night felt rewarding at being able to experience both a VIP-like shopping experience and the chance to interact with two people whose opinions I highly respect. -As the night drew to a close, it was evident the power that bloggers like Anna and Lily have with their trusted recommendations as one of their personal holy-grail products, the Oskia Renaissance Gel Cleanser, flew off the shelves and sold out on the night. However, aside from our shared love of products, the relaxed atmosphere of the evening proved that personality goes a long way alongside opinion in the world of YouTube to bring the viewers closer to the faces they see on screen. Next time, I’ll be setting an alarm to try to get a place at another Beauty Chat Live session without having a meltdown in the process, and be poised to pick up the first Oskia Cleanser I see.